In a bid to strengthen its commitment to offer innovative solutions to customers, Tata Motors CVBU division celebrates National Customer Care day on 23rd October every year to commemorate the day the company got its first customer. 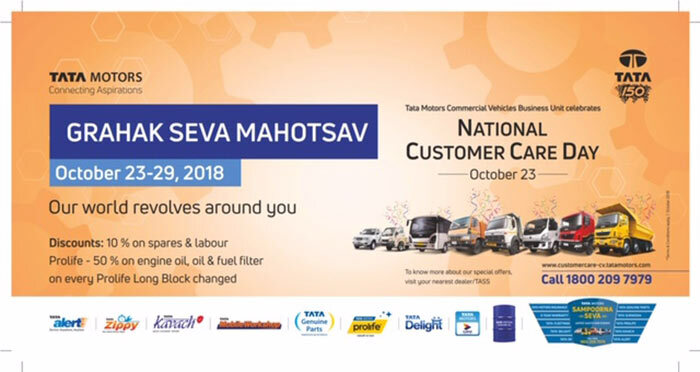 Tata Motors expresses gratitude to customers every year and initiates a nation-wide free service camp ‘Grahak Seva Mahotsav’ for all Tata commercial vehicle owners across the country. This unique customer centric initiative will take place across 1500+ Tata Motors workshops between October 23 and 29, 2018. At this service camp, owners can also avail attractive discounts on spare parts, labour and Profile Engine purchases. The Grahak Seva Mahotsav conducted last year received an overwhelming response with over 1.5 lac customers visiting the camp. Commercial vehicles are the pillars of strength of any country’s economy. This initiative has given us an opportunity to support those who support our economy. At Tata Motors, we have always aimed to provide the best after sales experience to all our customers. On the very special occasion of National Customer Service Day, we wish to celebrate the close connect we share with our valued customers and trusted channel partners. The Grahak Samvaad initiative will help Tata Motors achieve new heights of customer satisfaction by providing a host of innovative solutions to commercial vehicle owners. · Customer Care App: Single window mobile application which gives access to a host of features including emergency SOS, Service Booking facility, Maintenance tips, Service History, Dealer location GPS Trip Meter, Daily diesel prices, DEF locator, etc. · Tata Alert: Roadside assistance programme with assurance of problem resolution within 24 hours for all Tata Motors commercial vehicle models under warranty period, anywhere across the country irrespective of location. Acknowledgement time of 30 minutes & reach time of 4 hours, else a compensation paid up to Rs. 1000/day. · Tata Zippy: This is a repair time assurance programme applicable for any BS4 vehicle which is reported at Toll-free/ Workshop within 12 months from its date of sale or 14 months from its date of production (whichever is earlier). Assurance of problem resolution within 48 hours, else a compensation paid up to Rs. 500 to Rs. 2000/day and up to Rs. 5000/day post 24 hours on Prima Tippers. · Tata Kavach: This programme is for accidental repairs with assurance of 15 days repair time or else compensation upto Rs. 2000/day is paid to customers on account of delayed delivery for accidental vehicles. It is applicable for vehicles that are insured under Tata Motors Insurance, at selected workshops only. · Tata Fleet Management Solutions (FMS) is offered to large customers/fleet owners, covering the gamut of vehicle maintenance. Tata Motors takes complete ownership of vehicle repair & provides 24×7 service facility and caters to 71% to City’s transport need. The service is presently provided to DTC and CTU covering 5,00,000 Kms daily. Special promotional offers associated with spare parts, labour and Profile Engine purchases.